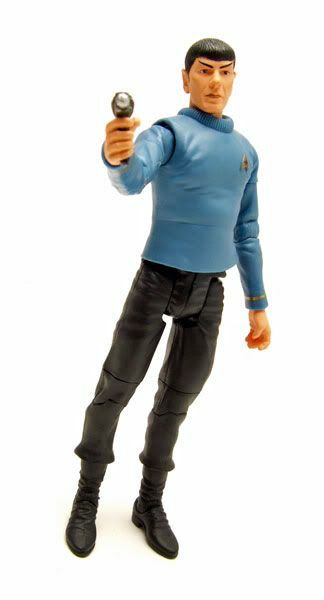 Spock was released carded as a Toys R Us Exclusive on Diamond Select's "Universal Star Trek branding" card. The Rundown: DST has been cranking out figures pretty quickly for Toys R Us since they reached a distribution deal with them. This is both a good and bad thing. Good in that it gets us more figures, bad in that it's kind of a slap in the face to the comic and online retailers that waited literally YEARS for some product to arrive (TNG Wave 5 anybody?). If they are able to turnaround figures in just months for Toys R Us, why are comic shops and other online retailers forced to wait years for product? Sure, the Toys R Us deal is great for DST, but those smaller retailers are what have kept these lines alive for years and deserve the same, if not better treatment. Sorry...little rant there...back to the figure! 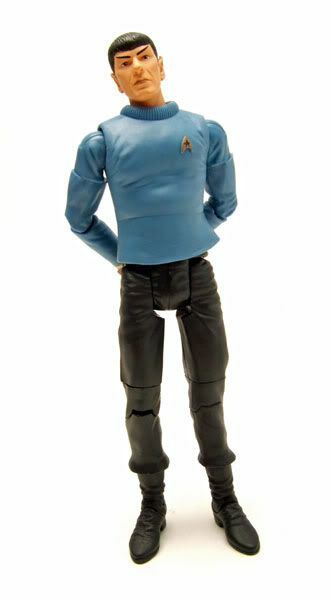 "Cage" Spock has seemed like a no-brainer figure for awhile now. I'm kinda surprised it's taken this long to get him out there. His choice as an exclusive for Toys R Us seemed *ahem* logical. 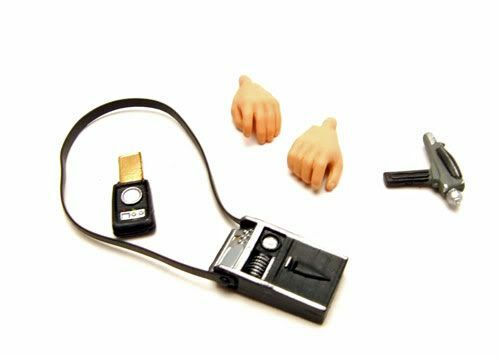 Unfortunately, cost-cutting measures keep this figure from being as good as it could have been. 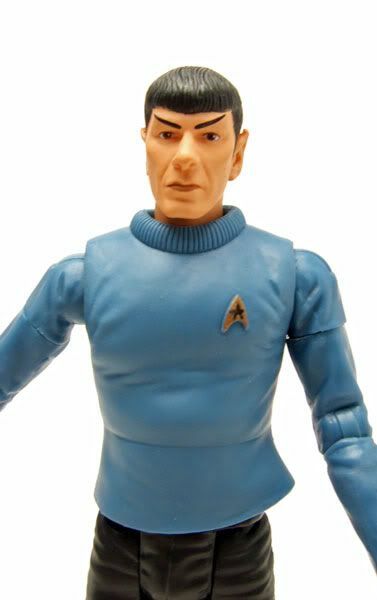 Instead of a new sculpt or even tweaking the old one somehow, we get the same Spock head we've seen since the first Art Asylum wave. Not to sound like too much of a fanboy, but the head isn't really accurate for "The Cage" (or "Where No Man Has Gone Before"). Hie eyebrows are different in the episode, and his hair isn't quite so neatly groomed. Even changing the eyebrow paint app just a little would have gone a long way to differentiating this Spock. And then there's the shirt. There's only been one AA/ DST sculpt for the 'ribbed-collar' pilot shirts; It's the same sculpt used for Pike and WNMHGB Kirk. 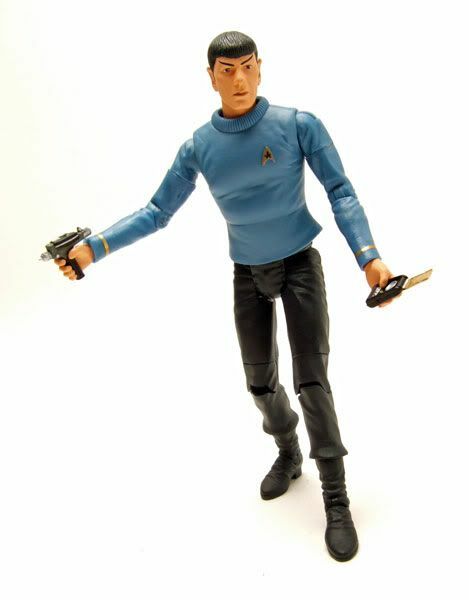 The problem with using that sculpt for Spock (and on the mailaway WNMHGB Sulu) is that the insignia on the chest is for command, which doesn't work for Spock or Sulu. Diamond's solution to this? Ignore it and leave it as a command symbol. That's just plain cheap. I know the symbol is sculpted on there, but would have been that tough to just paint the correct symbol over the sculpted one? So that's the major faults... but I should probably also mention a couple of quality control issues though too. See that weird line in the middle of his shirt? That's from the twist tie keeping him in package. He's been sitting open on my shelf for awhile now and it still hasn't gone away. It looks funky and causes the shirt to sit improperly. Oh, and from the 3 open ones I've actually held, the left shoulder joint feels somewhat loose and rubbery. 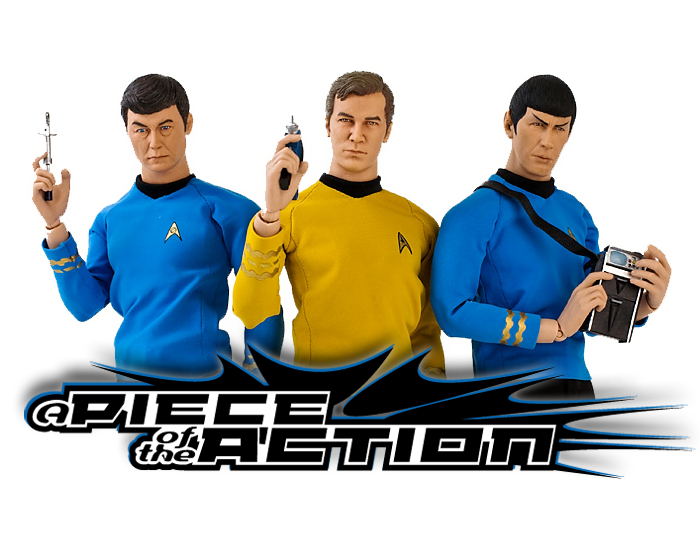 Accessories: Spock comes with 2 extra hands, a tricorder, a phaser, and a communicator. One more cheap shot from Diamond...we don't even get "Cage"-centric accessories! So even though we are getting some pretty rapid waves through Toys R Us- remember that quantity doesn't mean quality. 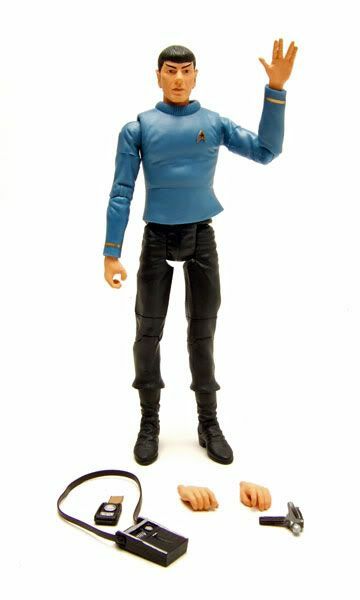 In the case of Spock here, what could have been a really good figure becomes just a mediocre one.